CK Power has long been known as a provider of completely custom power solutions. And a few years ago —when Tier 4 emissions regulations were just emerging as a concern— we were fortunate enough to have the opportunity to work with many customers and markets to custom-engineer some of the first high-power Tier 4 Final solutions in North America. Today, Tier 4 is the standard. And while the marketplace begins to develop their own solutions, our line of generators ranging from 500 kW to 1250 kW have been on the ground, in use and proving their worth for years. With a complete line of standard high-power generators available in any power output or configuration, we have a generator for your market or application. But we also have the flexibility and engineering know-how to fully customize a high-kW generator to the needs and pressures of your application. Our entire fleet of high-power Tier 4 Final generators runs off the same, proven platform — and has for years. It’s a simple, powerful and efficient Tier 4 solution that reduces maintenance needs while ensuring long-term durability. To reduce particulate matter (PM) and nitrogen oxide (NOx) levels, our generators rely on a lean, effective emissions control system consisting of only selective catalytic reduction (SCR), light exhaust gas recirculation (EGR) and a diesel particulate filter (DPF). For a detailed explanation of how it works, check out our article on our clean diesel technology. Many other Tier 4 solutions require a tedious maintenance procedure called regeneration to burn off excess PM as it accumulates on the DPF. Because our platform naturally produces lower levels of PM than other generator lines on the market, the need for regeneration is eliminated — meaning less downtime. And because our entire fleet runs on the same Tier 4 solution, maintenance needs will be consistent across your fleet. On the larger kW end of our high-powered generator line, we use two Tier 4 generators in a paralleled configuration. We would, for example, use two 550 kW generators in a paralleled configuration to achieve a 1100 kW output, or two 450 kW generators to achieve a 900 kW output. This is called a dual or twin pack configuration. Using two generators instead of one prevents the risk of wet stacking, which is caused by running a generator set lower than 80% its rated kW output for extended periods of time. When less power is required, the second generator will shut off — preventing the possibility that either generator will be light loaded. Dual pack configurations not only prevents light loading, but also increase the longevity of the entire gen set. Different applications and markets have different needs. Our high-kW generators can come in a range of configurations, from open skid-mounted to standard enclosed to containerized generators. We have full lines of each configuration engineered, manufactured and readily available for a wide range of applications. Or we can custom-engineer a higher kW set perfectly equipped with the features and customizations needed to handle your application. Open skid-mounted Tier 4 generators come in a low-cost, compact package popular for use in the oil and gas and mining / aggregate industries. Without a sound enclosure, these generators are a cost-effective way to achieve Tier 4 compliance if the application allows for an open configuration. Sound enclosed generators are durable, easy to use and customizable for any application or end use. Because of their versatility, sound enclosed generators are especially popular in the rental market — although they can be used for almost any market. All our Tier 4 sound enclosed generators are designed to achieve an acoustic rating of 75 dB(A) at 7 meters —the measure of how sound is heard by the human ear— which will meet most municipal noise regulations. And we can design your sound enclosure to achieve even the strictest noise regulations —as low as 65 dB(A) at 1 meter— depending on the needs of your application. Containerized generators come in 40-foot or 53-foot ISO containers on a fifth wheel chassis. While they have a larger footprint than other high-power generators, containerized generators are more durable and have more room for value-added customizations such as large fuel tanks or higher levels of sound attenuation. CK Power’s line of containerized generators come standard with features external fuel and diesel exhaust fluid (DEF) supply and return, four access doors, emergency stops, LED interior lighting and a Department of Transportation (DOT) certified trailer. And with near limitless customization options and a wide range of power output —from 500 to 1250 kW— containerized generators are a perfect fit for any application requiring configurability, durability or mobility. 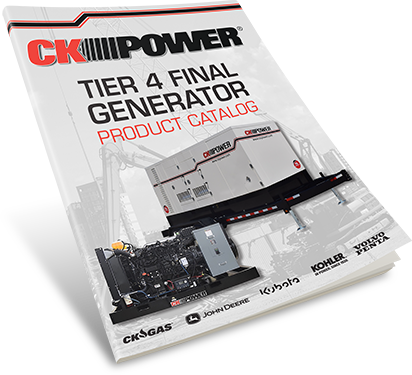 To learn more about our lines of higher kW generator offerings, fill out the form below to download our Tier 4 Final product catalog. Or, if you’d like to learn more about the work we’ve done to evolve in response to Tier 4, read our guide to clean diesel technology. You’ll receive a down-to-earth explanation of Tier 4 emissions control technology works — and the effect cleaner power generation has on our environment.